Live in the moment—and capture it. The interesting moments of our lives are as elusive as they are beautiful. 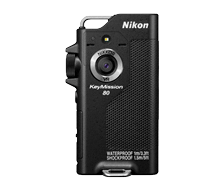 The quick-shooting KeyMission 80 effortlessly captures them all to preserve, share and enjoy for a lifetime. Lightweight and wearable, it's always on the ready, even in rain and extreme cold. Clip it on and record outstanding 1080p videos and 12-megapixel photos. Use time-lapse or interval timer and document an entire day in your life, while each shot is automatically transferred to your smartphone through Wi-Fi® and Bluetooth® low energy. Get out from behind the camera and start living in the moment. KeyMission 80's small, lightweight design and single-handed operation means you can finally enjoy the moment and capture it. The supplied holder clips nearly anywhere and is ideally positioned for quick access when interesting moments happen. And despite being as small as a smartphone, KeyMission 80 delivers photo and video quality in a class of its own. Some of the most interesting, beautiful moments happen outdoors in conditions that aren't ideal for a conventional camera or smartphone. KeyMission 80 goes where the action is. It's waterproof down to 3.4-feet, freezeproof to 14°F and shockproof from drops up to 4.9-feet, making it ideal for trips to the pool and the beach, fishing, kayaking, camping and hiking, jogging, walking, cycling and so much more. With the SnapBridge app installed, KeyMission 80 is connected to your compatible smart device. Photos are automatically transferred to your smart device as they're taken, making it easy to review, edit and share your photos in the moment. SnapBridge also adds GPS and time/date information to your photos, so you can retrace your day or trip. You can even add your own captions, comments and SnapBridge logos to your photos. KeyMission 80 features an exclusively designed compact NIKKOR lens. This outstanding 25mm f/2.0 equivalent lens captures spectacular details and textures, even in low light situations. Optical Vibration Reduction (VR) image stabilization counteracts camera movement for sharp photos and steady videos, crucial for a wearable camera. KeyMission 80's image-processing power also allows you to capture vivid, high-contrast landscape images. In addition to the main camera, KeyMission 80 includes a second 4.9-megapixel camera on the back for self-portraits. The LCD monitor faces you, so composing your shot is easy. Take center stage with the whole wide landscape spread out around you. Capture your experiences as they unfold with Route Shooting. Set KeyMission 80 to capture either 100 stills or 10 three-second movies within a specified period, and then go about your day. The 10 three-second movies are combined into a single movie, approx. 30 seconds long. All measurements are performed in conformity with Camera and Imaging Products Association (CIPA) standards or guidelines.1. Battery life does not reflect the use of SnapBridge and may vary with the conditions of use, including temperature, the interval between shots, and the length of time that menus and images are displayed.2. Individual movie files cannot exceed 4 GB in size or 29 minutes in length. Recording may end before this limit is reached if camera temperature becomes elevated. 3. Dropped from a height of 150 cm. (5 ft.) onto a surface of 5 cm. (2 in.) thick plywood (changes in appearance, such as paint peeling off and deformation of the drop shock portion and waterproof performance are not subject to the test).These tests do not guarantee that the camera will be free from damage or trouble under all conditions.